2 How to take haritaki? 6 How to eat haritaki fruit. 7 Is haritaki good for you? 9 What is haritaki powder? 10 What is haritaki in Telegu? 19 What is Terminalia chebula? 21 Does haritaki help digestion? Mix half teaspoon of powder with ¼ cup water and drink. Take at night after your food for maximum effect. Haritaki is available in powder or capsule form. Haritaki powder is extremely bitter. Haritaki is an Indian Ayurvedic fruit that is renowned as the “King of Herbs” in Ayurveda. The fruit is harvested and dried and powdered. This powder is what is used most in herbal remedies. Haritaki cleanses the digestive tract of toxins and speeds up the elimination process. The digestive tract works more efficiently. Haritaki has antibiotic and anti-bacterial properties. Harad is the Hindi word for Haritaki. How to eat haritaki fruit. Haritaki fruit can be boiled and made into a tea. Is haritaki good for you? What is haritaki in Telegu? Haritaki fruit comes from the tree Terminalia chebula that grows in India and throughout SE Asia. The fruit is green and the size of a walnut. The fruit pulp is what is consumed. Terminalia chebula is the English name for haritaki. In the evening after the last meal of the day is most effective. It can be additionally taken in the morning. A tree that grows to approximately 100 ft throughout SE Asia. It produces a fruit called haritaki. This fruit has many health benefits. Online at www.haritaki.org it comes in powder or capsule form. 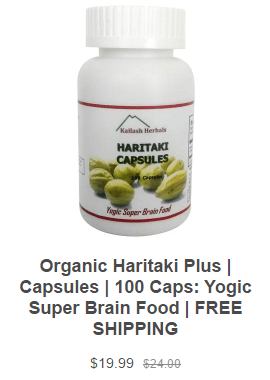 Yes haritaki speeds up and cleanses the digestive tract.